Absolutely Waterford’s River’s Edge Art Walk, now in its third year, will again transform the streets of the downtown heritage district into an impressive fine arts walk from 5 to 9 p.m. featuring the work of more nearly 30 professional artists showing and selling their works throughout local businesses and community buildings. REAW attendees can expect to view a wide range of fine art, including ceramics, woodcraft, water and oil paintings, photography, jewelry, pottery, fabric and more. 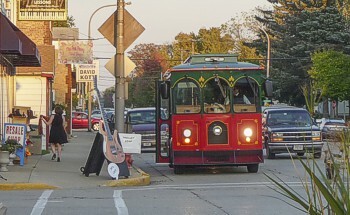 In addition to a variety of area artists, the family-friendly fall event features live performances by talented musicians, trolley rides throughout the downtown, and a sampling of the best food and shopping Waterford offers. As with previous years, art students from Waterford Union High School will get a taste of what it’s like to exhibit and sell their art work during the Art Walk. New this year, trolley passengers will get to learn a bit of downtown history, with a narrative provided by Absolutely Waterford officials who have been busy researching the village’s earlier years.